Continuing on with the Abandoned II series, all that remains in a kitchen cupboard. A rather strange combination of liver salts and custard powder. Such few items, simply draws attention to each of them. nice picture but whatever in the world is liver salt??? Custard powder I can pretty much figure out but not liver salt. Livers salts is a medicine to relieve an upset stomach. 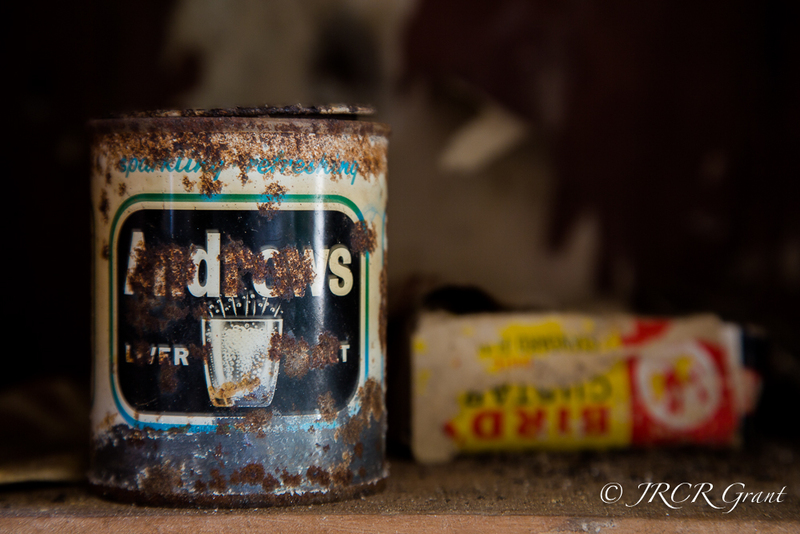 there was always a tin in the house…. Incongruous mixture side by side . Nice picture MM ! Classic! Oh my, I haven’t seen a tin of Andrews in years. I was going to ask what you were going to make with these “lovely” ingredients! I think I’ll go out for dinner lol.